Besides, it has the support of its team of Client Relations and Research for the study and analysis of the markets. 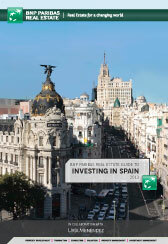 It is present in Spain since 1988, where it has 130 employees and 3 delegations. In our country, BNP Paribas Real Estate has closed more than 50 investment deals in 2016, leased or sold 1.2 of commercial property, valuated more than 3 million sqm and managed close to 1.1 million sqm.